Shopping for a new GMC Sierra 2500HD? A 2018 GMC Sierra 2500HD in SLT trim with all the goodies clocks in at a few thousand cheaper than a Denali, and with nearly all the bells and whistles. What’s that name worth to you? The 2018 GMC Sierra HD would be at home at any jobsite. Likely found in the foreman’s lot, we suspect. The 2018 GMC Sierra HD is Western wear with starch. It’s based on the Silverado HD, but the GMC heads for the hills in terms of price and luxury appointments, based on its buyers’ preferences. Most models are four-door crew cabs with room for adults. Most of those are Denali models with luxury appointments you might expect from imported sedans. And most of those are fitted with a powerful diesel engine that can tow thousands upon thousands of pounds. This year, the GMC Sierra HD stands pat after a redesign last year. Base Sierra HD models get a standard rearview camera and a 7.0-inch touchscreen, while top-trim Denali models get a new grille. The entire range is available as a 2500 three-quarter ton pickup, or as a 3500 one-ton version with single- or dual-rear wheel setups. The powerplants are a pair of V-8s powered by fermented dinosaurs, with the level of refinement the only difference. 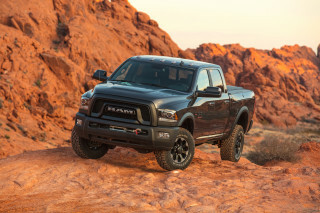 A 6.0-liter V-8 gas model makes 360 horsepower and is the payload champ at more than 3,500 pounds in some configurations. 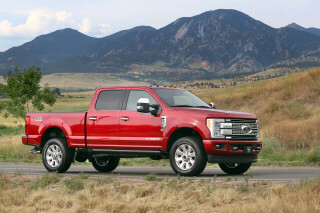 A 6.6-liter turbodiesel makes 910 pound-feet of twist and can tow up to 18,000 pounds, if that’s what you’re into. The Sierra HD is offered in base Sierra, SLE, SLT, and Denali trims, with regular, extended, and crew cab models available. An 8-foot box is available with all cab configurations, while a 6-foot-6 bed is available on extended- or crew-cab models. The GMC Sierra HD makes do with the style it has, which isn’t much at all. And that’s not a bad thing. The GMC Sierra HD is more conservative in its style than other big trucks, but we don’t mind. Sharp corners, creased fenders, and tall grilles add up to a modern look that isn’t very adventurous, but it’s not tiresome either. Denali models get their own new grille design for 2018 that swaps out the honeycomb pattern for a three-bar look that frames the GMC badge in the center of the grille, but not middle, which isn’t helping our obsessive tendencies. The overall look is a stretched affair from the GMC 1500, which is a good look overall. Last year a functional hood scoop was added to diesel-powered models, which helps feed the big engine more air. The 2018 GMC Sierra boasts two available big V-8s that make it one of the most capable trucks on the road. If you were confused about the 2018 GMC Sierra HD’s commission, the pair of V-8s under the hood should clear things up. Equipped with either a powerful 6.0-liter gas-powered V-8 or a torquey 6.6-liter turbodiesel V-8, the GMC Sierra HD is among the most powerful machines on the road today. The standard engine on all models is a 6.0-liter V-8 that makes 360 horsepower and 380 pound-feet of torque. 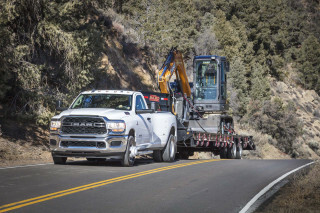 It has reasonable pull and is rated to tow more than 13,000 pounds in all configurations, all the way up to 14,800 pounds in rear-drive with a gooseneck hitch. It shines in payload capability and is able to haul more than 3,500 pounds in the bed in some configurations. The optional 6.6-liter V-8 turbodiesel was new last year and makes an eye-watering 910 lb-ft of torque. 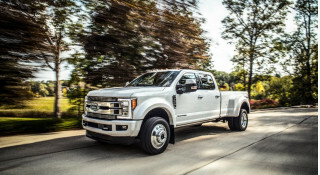 With all that low-end grunt, it’s no surprise that the diesel engine is rated to tow more than 18,000 pounds in some cases, which would require a CDL. 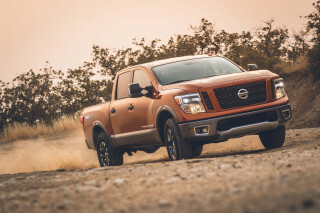 What’s surprising is how often the turbodiesel is ordered: half of Sierra HD models are high-priced Denali versions and 90 percent of those are equipped with the diesel engine. 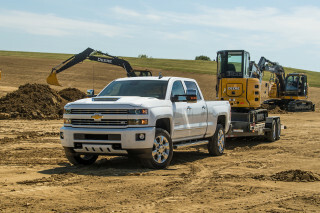 The Sierra HD is based on the Silverado HD, so the two share many common powertrain components. Like the Chevy, GMC mates both of its engines to a 6-speed automatic designed to haul—not necessarily for efficiency. Like other heavy-duty trucks, the GMC Sierra is available in single- or dual-rear wheel configurations, the latter of which is only available on 3500 HD models. Rear-wheel drive is standard on all trucks, but four-wheel drive is a common upgrade for many owners. Unlike the heavy-duty Ram pickup, the GMC Sierra uses a typical front strut, rear leaf spring suspension setup that’s better suited for towing and hauling than overall comfort. But if you’re not towing or hauling with your big rig, what’s the point? Quiet, comfortable, big, and capacious—what more could you ask for? Big pickups should be capable; the 2018 GMC Sierra HD happens to be comfortable too. It’s no surprise it scores well on our comfort and quality scale, which favors big vehicles anyway. 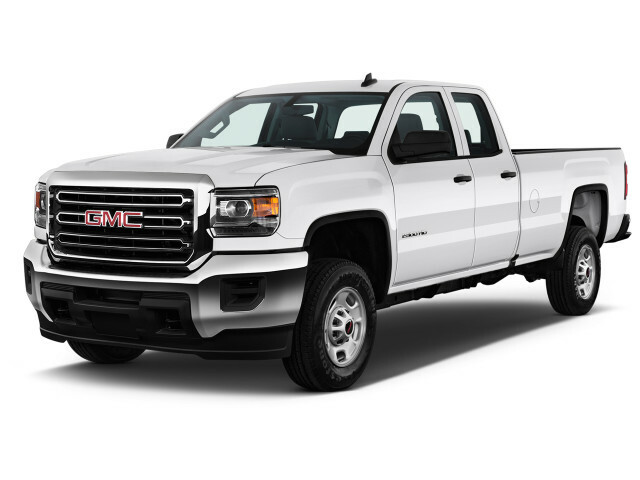 GMC offers the Sierra HD in three cab configurations and two bed lengths. Standard Sierras are available with a regular, two-door cab; those stripped-out trucks will be spotted less often than pandas in the wild. An 8-foot bed is standard on those models. A four-door double cab is available with a truncated rear bench that’s suitable for adults on short trips. A 6-foot-6 box is offered on those models, but more likely those will come equipped with long, 8-foot boxes instead. Double cab trucks offer 34 inches of rear leg room, by the numbers. In reality, it’s a little smaller than that and the seating position is more upright than crew cabs. Most trucks will be full-length four-door models with a 6-foot-6 or an 8-foot bed, provided you have docking papers for the latter. All versions of the Sierra are comfortable, but most versions will be high-priced Denali editions—with 90 percent of those trucks sporting a diesel engine under the hood. Road noise is kept at bay and clatter from the big diesel engine is nearly nonexistent. A lack of crash data means we don’t score the 2018 GMC Sierra HD pickup. A lack of complete crash-test results keeps us from rating the GMC Sierra 2500 HD, but what’s in so far is mixed and the Sierra lacks some advanced features. Federal regulators weren’t kind. The 2018 GMC Sierra HD earned a four-star overall score including four stars in frontal crash safety and a three-star score in the calculated rollover score. The latter score isn’t a surprise, blame the Sierra HD’s tall ride height. The front-crash rating is proof that bigger isn’t necessarily safer. All Sierra HD models come equipped with six airbags, stability and traction control systems, and a rearview camera. Denali-trimmed trucks add standard forward-collision warnings, lane departure warnings, and front and rear parking sensors. Those features are available as extra-cost options on SLE- and SLT-trimmed trucks. In addition to emergency notifications provided by OnStar, the GMC Sierra HD also offers Teen Driver Alert that tattles, or reports, driving behavior to parents. The GMC Sierra HD is handsomely equipped in base trim, but who are we kidding? Most buyers go straight for high-zoot Denali models. From the outside, the 2018 GMC Sierra heavy duty might not look much like a luxury car, but from the inside we guess you might be fooled. 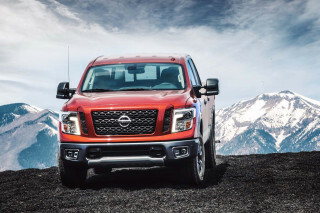 All heavy-duty Sierra trucks come equipped with 17-inch wheels, Bluetooth connectivity, cloth upholstery, power windows and doors, a rearview camera, and a 7.0-inch infotainment touchscreen. 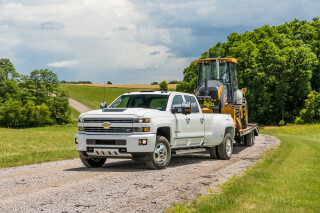 Unlike the Chevrolet that it’s related to, GMC doesn’t offer a work truck-trim for fleet buyers and base retail models are trimmed fairly closely. That base trim package is just called Sierra, by the way. 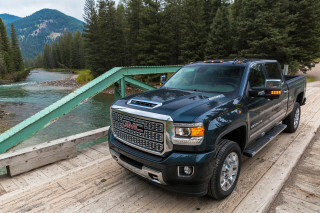 From there, GMC offers the Sierra heavy-duty range in SLE, SLT, and Denali trim levels. SLE-trimmed trucks add keyless entry, an upgraded 4.2-inch driver information display sandwiched between instruments, remote locking tailgate, and an 8.0-inch touchscreen for infotainment. The next step, SLT, isn’t as interesting for what it is, rather what it can become. Beyond the leather upholstery, dual-zone climate control, 18-inch wheels, and remote starter, those trucks can be fitted with an off-road package that’s subtle like a neutron bomb. GMC calls it the “All Terrain X HD” package, but we call it “zombie runner.” In addition to blacked-out treatment everywhere including the wheels, bed rail, and bumpers, the Terrain X HD appears ready for a post-apocalyptic reality—so long as it’s big enough for the massive truck. At the top of the pile is the Denali trim, which transforms the truck into a large-and-in-charge luxury liner. The Denali level adds heated and cooled leather seats up front, heated steering wheel, 20-inch wheels, an uprated 8.0-inch driver information display, wireless phone charging, Bose audio system, front and rear parking assistance, navigation, and a suite of advanced safety features that we cover separately. All Sierra HD models come equipped with GM’s OnStar system that can provide emergency assistance, turn-by-turn navigation, concierge services, and wi-fi data services with an optional subscription after a trial period ends. GMC’s infotainment system is functionally identical to Chevrolet’s system, and is one of our picks for its ease of use and Android Auto and Apple CarPlay compatibility. Unlike the Chevrolet Silverado HD, with which the Sierra HD shares many features, the GMC truck doesn’t offer many special edition packages to clutter the exterior. This year a newly available off-road package can be equipped to SLE and SLT models outside of the All-Terrain look, and a snow plow prep package is offered on Sierra HD models. The EPA doesn’t rate heavy-duty trucks like the 2018 GMC Sierra 2500 HD. Fuel-efficiency slots in somewhere between “Who cares?” and “What’s that?” in most heavy-duty pickup owners’ minds. We’ll take umbrage: These models outsell many others on the roads today, and for better or worse, heavy-duty trucks are turning into family vehicles. We’ll update this space if that changes, but we’re not holding our breath. Our long-distance drive across Wyoming in a diesel-powered Sierra 2500 HD netted highway mileage just shy of 19 mpg over 500 miles. That’s about par for the course when it comes to big trucks. MSRP based on 2WD Reg Cab 133.6"
Looking for a different year of the GMC Sierra 2500HD?